Our mission is to improve health in Greenville County, SC, by identifying critical issues, catalyzing community action, and supporting organization’s health related programs. By tackling the root causes of community health issues and aiming for changes to the larger system, we focus our efforts on improving health in a broad way to create sustainable change. Looking beyond the traditional medical system as a means to wellness. A lack of access to healthcare, employment, recreation, healthy meals and life essentials are proven determinants of health. That’s why we look beyond the traditional medical system as a means to wellness. Economics, the built environment, education, public safety, and more, have a proven impact on a community’s health. These are factors that we believe money alone cannot solve; it takes a cultural and structural change within the community in order to improve the health and quality of life for all people in Greenville County. 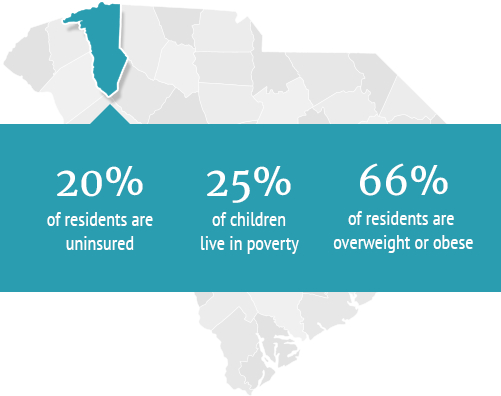 Far too many residents of Greenville County are overweight or obese. We aim to make the healthy choice the easy choice in our schools, workplaces, after school programs, faith communities and more. While Piedmont Health Foundation seeks to tackle big issues, the budget is lean. We band together with community partners whose actions perpetuate the changes needed in our community. By bringing together the right people at the right time, we create significant impact and sustainable difference in the health of our community. that we believe money alone cannot solve; that it takes a cultural and structural change within the community in order to improve the health and quality of life for all people in Greenville County.